This morning, I had a fantastic experience. I walked into Starbucks for my morning prayer and smiled at what I was hearing. Yes, much to the displeasure of many, I consider going to Starbucks everyday to be my version of attending morning Mass. On this date in 1915, Eleanora Fagan was born. 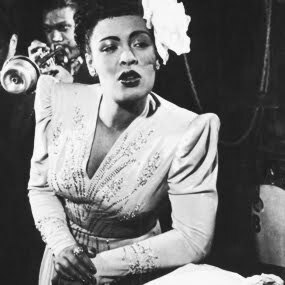 Ms. Fagan would later adopt the name Billie Holiday - from Billie Dove, an actress she admired, and the musician Clarence Holiday, her probable father. Ms. Holiday, or Lady Day as her friends called her, had an overwhelming and lasting influence on jazz and pop singing. Her vocal style, strongly inspired by jazz instrumentalists, inaugurated a new way of turning a phrasing and maneuvering in and out of a tempo. Billie Holiday's troubled personal life - a life of prostitution, addiction to alcohol and heroine, as well as having a string relationships with abusive men - was chronicled in the 1972 film Lady Sings the Blues, which starred Diana Ross and Billy Dee Williams. Based on Holiday's autobiography of the same title, the film was nominated for five Academy Awards - including a Best Actress in a Leading Role nod for Miss Ross. On November 10, 1956, Billie Holiday performed two concerts before packed audiences at Carnegie Hall, a major accomplishment for any artist, especially an African-American artist of that certain period of our country's history. This seemed to be the pinnacle of her career. It was evident, even then, that Miss Holiday was ill. I had known her casually over the years and I was shocked at her physical weakness. Her rehearsal had been desultory; her voice sounded tinny and trailed off; her body sagged tiredly. But I will not forget the metamorphosis that night. The lights went down, the musicians began to play and the narration began. Miss Holiday stepped from between the curtains, into the white spotlight awaiting her, wearing a white evening gown and white gardenias in her black hair. She was erect and beautiful; poised and smiling. And when the first section of narration was ended, she sang – with strength undiminished – with all of the art that was hers. I was very much moved. In the darkness, my face burned and my eyes. I recall only one thing. I smiled. Throughout the night, Billie was in superior form to what had sometimes been the case in the last years of her life. Not only was there assurance of phrasing and intonation; but there was also an outgoing warmth, a palpable eagerness to reach and touch the audience. And there was mocking wit. A smile was often lightly evident on her lips and her eyes as if, for once, she could accept the fact that there were people who did dig her. The beat flowed in her uniquely sinuous, supple way of moving the story along; the words became her own experiences; and coursing through it all was Lady's sound – a texture simultaneously steel-edged and yet soft inside; a voice that was almost unbearably wise in disillusion and yet still childlike, again at the centre. The audience was hers from before she sang, greeting her and saying good-bye with heavy, loving applause. And at one time, the musicians too applauded. It was a night when Billie was on top, undeniably the best and most honest jazz singer alive. Even with an adoring audience and loyal fan-base, addiction still had it's hold on her through the coming years. On May 31, 1959, Holiday was taken to Metropolitan Hospital in New York suffering from liver and heart disease. As she lay dying, she was arrested for drug possession and her hospital room was raided by the police. 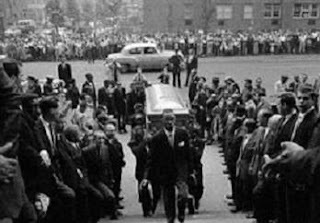 Holiday remained under police guard at the hospital until she passed away on July 17, 1959. In the final years of her life, she had been scammed out of almost every dollar she had. At the time of her death, she had only $.70 in the bank and $750 in her purse. The cash in her purse was payment from a tabloid for her story. Happy Birthday, Miss Holiday. Your imprint is forever cemented on jazz and the music world in general.